CLAY COUNTY, Fla. — The Clay County Sheriff's Office clarified rumors that Clay County was a sanctuary county Tuesday. Sanctuary cities are a hot button issue right now. President Donald Trump is saying he'd send undocumented immigrants to sanctuary counties. 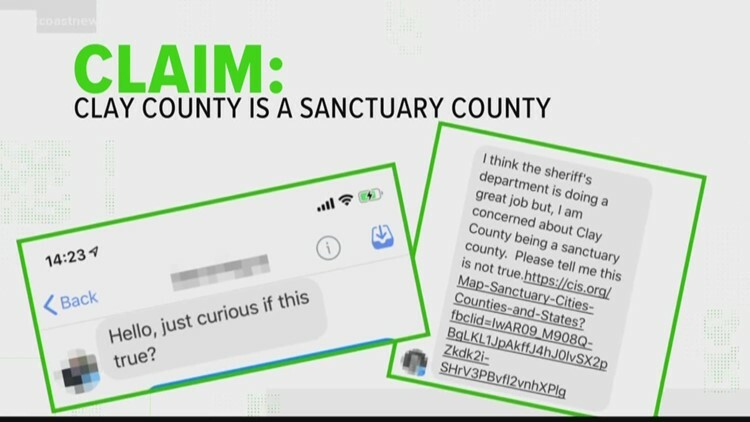 The Clay County Sheriff's Office was contacted by residents saying there was a claim going around that said Clay County was a sanctuary county. The sheriff's office ended up sending out a statement to the media debunking it. The false information reportedly came from Cis.org, a pro-immigration rights website. It listed Clay on its list of sanctuary municipalities. First Coast News news director called Cis and learned the organization pulled Clay off of its map and list Tuesday morning. Sheriff Daniels told the First Coast News Verify team, "We work closely with the U.S. Immigration and Customs Enforcement- known as ICE- and have a great relationship with their organization, so don't be fooled by those seeking to mislabel us." So First Coast News can VERIFY that Clay County is not a sanctuary county. If you have something for us to verify, send us an email to Verify@FirstCoastNews.com.